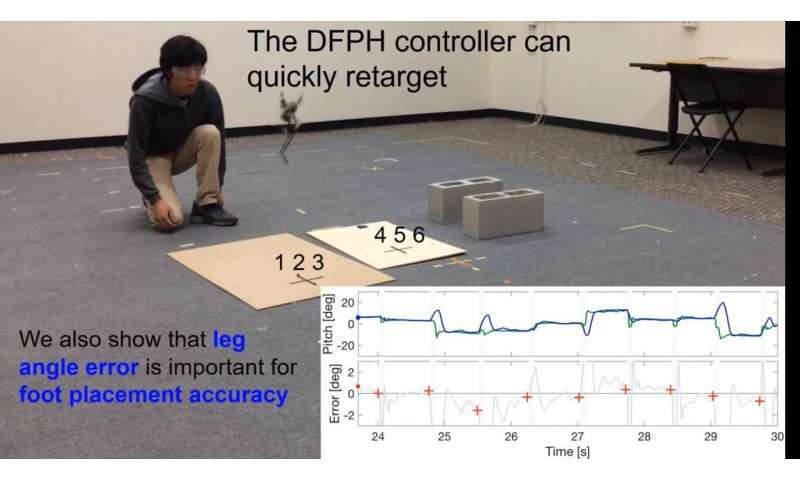 "Precision Jumping Limits from Flight-phase Control in Salto-1P" is the academic sounding title of a paper that should nonetheless delight those interested in robotic movement. Justin Yim and Ronald Fearing, Department of Electrical Engineering and Computer Sciences, University of California, Berkeley, are the paper's authors. Their work was presented earlier this month at IROS 2018 in Madrid. This is a monopedal robot, called Salto-1P. Video notes further described Salto-1P as a small monopedal jumping robot capable of continuous high-power hopping. Why do they call it Salto? James Holloway in New Atlas satisfied the curious. Saltatorial Locomotion on Terrain Obstacles is the answer, whatever "saltatorial" means. Holloway and Google helped out there too. Saltatorial means adapted toward leaping. Saltus is a Latin word for leap. Actually, watching a one-legged robot jump around in a non-stop frenzy is strangely riveting itself. However, the researchers at UC Berkeley had more of targeted movements in mind. The team is fixed on delivering a robot that can do jumping that gets it right as to where it lands next. "Two small propellers allow the robot to twist in midair, but all the motive force comes from the single leg," said Hackaday. One can understand IEEE Spectrum choosing to call it a "robotic pogo stick" (but that is not the story; it is rather about what the stick can now accomplish). The researchers were not interested in just coming up with a hyper machine flinging itself about. TechCrunch wrote about its capabilities: (1) it can watch a surface for a target, wrote John Biggs, and (2) "essentially fly over to where it needs to land using built-in propellers." Why their recent work matters: It's all about the controller, which they upgraded to improve precision on landing—"a feat that was almost impossible using the previous controller system," said Biggs. Evan Ackerman explained that Salto-1P's hardware is the same as last year: one actuated elastic leg for hops, "an inertial tail that spins to control pitch, and half a quadcopter to control yaw and roll." But this year, it is all about the controller. The team's goal for Salto-1P was a better controller to do things that need accurate foot placement. Ackerman said that "even more aggressive behaviors, like jumping between walls, involves an entire sequence of jumps that all need to be accurate, since a single inaccurate jump will likely cause the robot to fall and smash itself to bits." In their paper, the authors discussed their deadbeat foot placement hopping control. What does that mean? Well, they are dealing with "a new control algorithm that can land Salto-1P's foot at particular spots on the ground like jumping on stepping stones or playing one-leg hopscotch." They are calling this "deadbeat foot placement hopping control". Holloway told New Atlas readers about the team's approach. "The controller uses what's known in mathematics as a Taylor series approximation, which can be used to approximate answers to complex equations, including those governing forces acting on a point." End result: a robot engineered such that it can not just hop but hop between designated spots, "as if jumping from stepping stone to stepping stone or playing hopscotch." It can hop on the ground, or between objects of increasing height, said Holloway. Their list of what's-next work on this leaping robot includes investigating the effects of non-rigid or sloped terrain on jumping performance and control strategy. Also, according to Ackerman, "We spoke with Justin Yim at IROS, who told us that he's working toward increasing Salto-1P's jumping precision even more, while also weaning it off of the external localization and computing systems that keep it confined indoors."